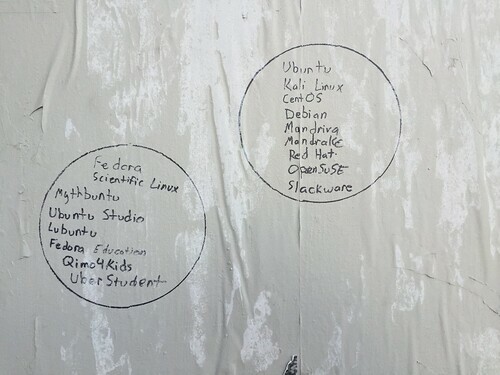 You know you’re in San Francisco when the graffiti is just a list of Linux distos. Linux users can be like that. Evoluent’s VerticalMouse 4 is one of the better ergonomic computer mice I’ve used. It’s comfortable, it doesn’t take much getting used to, and the price isn’t unreasonable. While it works great on Windows and Mac, the same can’t be said for Linux. The button mappings cause some truly odd behavior, particularly with the scroll wheel. Fortunately, there’s a quick fix. The important thing here is the ID number, which in this case is 10. It will vary from one computer to the next. Now we can assign a new button mapping. I like to keep it simple, so this will only activate the left and right mouse buttons (on either side of the scroll wheel) and will set the scroll wheel to scroll and act as middle click. If you want a different setup, I recommend reading this and this and playing with these values in xinput until your mouse does what you want. Note that I bolded the first parameter: as you may have guessed, that 10 is whatever ID you found above. Got it working? Good. Thing is, xinput will only temporarily set your mouse buttons. Once you reboot, they’re gone. The funny text I bolded is the device ID. (Again, it will likely be different on your system.) Now you can create a config file for your mouse. Note that this works on Ubuntu, perhaps your distro stores configuration files elsewhere. Also, note that the button mapping string does NOT start with the device ID you used above; that was only for xinput. Option "ButtonMapping" "1 3 0 4 5 0 0 0 2 0 0"
Easy, right? Well okay, not at all. 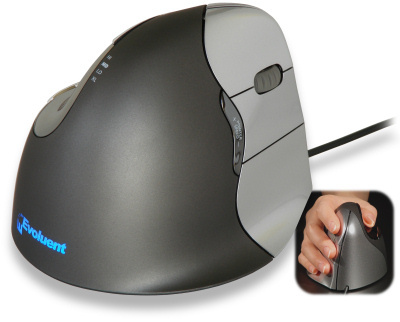 The lack of a good mouse configuration UI is a nasty oversight on modern Linux systems. Someone needs to make one. Ampache, for those who don’t know, is a personal streaming music service. It lets you play your MP3s anywhere there’s an internet connection. You don’t need anything special to play music via Ampache, just a web browser. But certain music applications integrate full Ampache support, which means you can browse all your MP3s from within the app. On Linux, I use Rhythmbox to play music. There’s an Ampache client for it, but it’s not as easy to install as it should be with newer versions of Rhythmbox. Make sure Rhythmbox is not currently running. Install or upgrade to Rhythmbox 2.95 (or 2.96) if you don’t have it already. For Ubuntu Oneiric, you can grab it off this PPA. Enter your server info here. Now close the dialog and double-click Ampache in the Rhythmbox sidebar. It may take some time to sync with your server, but once it does you should be good to go. Personally I find this plugin to work a lot better than the Amache plugins for Amarok and Banshee, but your mileage may vary. We’ve all heard a lot of bad news about Microsoft over the past decade, especially the past few years. Security problems, broken hardware drivers, annoying interface changes, confusing security features, etc. It’s gotten to the point where it’s tough to think of anything good about Windows, aside from the fact that “it’s there” and there’s a lot of games for it. But I see some good things about Windows where Microsoft has done the right thing, and done it consistently. Let’s look at those. Let’s say you’re running a business. You have a very important application that’s 20 years old, no longer supported, and there’s no budget to upgrade. What to do? Well if it was written for Windows (or even Microsoft’s previous operating system, DOS) there’s a good chance it still works perfectly fine today. In fact, if it doesn’t require any special hardware, it’s basically guaranteed to work. This saves you a lot of money on hiring people to write a new application. 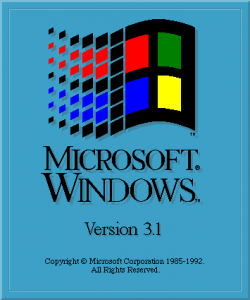 Backwards compatibility is a key feature of Windows. Even on a 64 bit Windows 7 machine, you can run applications designed for 32-bit Windows 2000 by design. I’m not sure if it’s more strange that Microsoft considers this a mandatory feature, or that Linux and Apple don’t bother. There’s certainly no technical reason NOT to support old applications, so this is definitely something Windows gets right. With the latest Visual Studio you can still write applications for Windows 2000 out of the box. Although the underlying architecture of Windows has changed quite a bit over the years, the core APIs are binary compatible. Sure, it takes some effort to avoid the convenient new APIs introduced in XP and Vista, but it’s by no means impossible. Whereas Apple charges for small upgrades to the OS, Microsoft gives them away for free in the form of service packs. These upgrades are designed to change as little as possible under the hood, but bring in new features, new applications, and security updates. Something most Windows users don’t even notice — when they work — is hardware drivers. Windows consistently ships with an amazing array of hardware drivers for just about everything. The major complaints tend to be printers and WiFi, where the manufacturer may need to supply something specific. But this is one area where Windows really shines compared to the competition. On Linux, hardware drivers can be impossible to find or tricky to install. Linux users often encounter issues with graphics *cough* ATI *cough*. Apple avoids the problem entirely by shipping only custom hardware; an easy solution that bypasses the issue. Linux is optimized for use as a server. Mac OS is optimized for multimedia. But Windows? It does a pretty good job at both, out of the box, without (much) configuration. Somehow they’ve optimized the timing in the kernel to allow for both. This is not as trivial as it sounds. Multimedia requires processing a rapid fire of tiny pieces of information. Servers require processing large chunks of information at unpredictable intervals. It’s not easy to adjust your timing to do both, but Windows pulls this off without a hitch. Windows isn’t all bad! Microsoft goes out of their way to make Windows a stable, consistent OS that runs a wide variety of applications. Keep this in mind next time a UAC prompt makes you want to put your fist through your monitor.